When Is Kamehameha Day 2019 in Hawaii? Is Kamehameha Day a Public Holiday? Kamehameha Day is a public holiday in Hawaii, where it is a day off for the general population, and schools and most businesses are closed. Kamehameha Day honors the life of Kamehameha the Great. Traditionally, Kamehameha Day celebrations included fairs, carnivals and running, horse and cycle races. Now various events are organized on or around Kamehameha Day. They include a floral parade through Honolulu; statues of Kamehameha the Great being draped in lei (traditional flower garlands); parties; horse riding competitions; and the King Kamehameha Hula Competition. Kamehameha Day is a state holiday in Hawaii. Many state offices and schools are closed and public transit services may run to a reduced schedule. Stores and other businesses may be open or closed. Kamehameha Day is not a public holiday in other parts of the United States on June 11. Kamehameha the Great, also known as Kamehameha I and Kamehameha the First, was ruler of Hawaii from 1782 until his death on May 8, 1819. He is remembered for uniting Hawaii, introducing laws to uphold human rights in combat situations, and for being a fair and stable leader. His name means "lonely" or "loneliness" and he is sometimes known as the "Napoleon of the Pacific". In 1871, the great-grandson of Kamehameha the Great, known as Kamehameha V, passed a royal decree that Kamehameha Day should be celebrated. The day was first observed on June 11, 1872, and was one of the first holidays proclaimed by the Hawaii State Legislature after Hawaii became a US state in 1959. Important symbols of Kamehameha Day are the statues of Kamehameha the Great in the Hawaiian cities of Honolulu, Kapaau and Hilo, as well as the National Statuary Hall on the US Capitol in Washington DC. 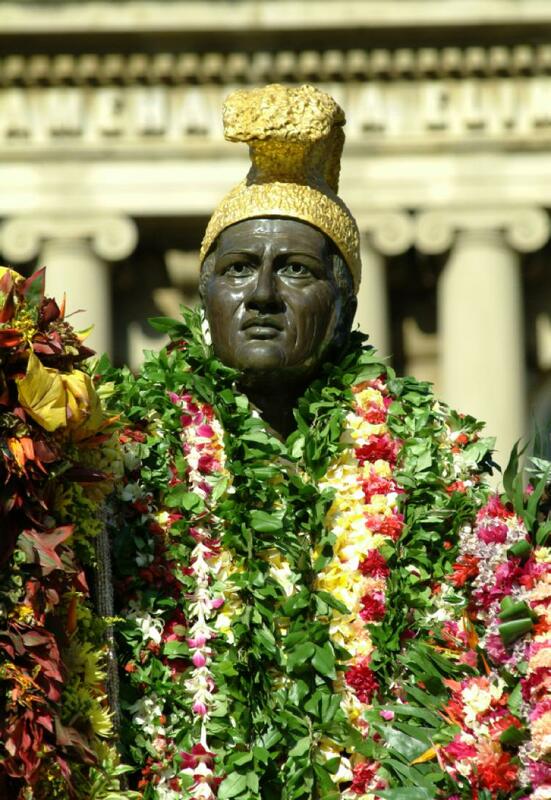 During the Kamehameha Day ceremonies, the statues are draped in lei. These are garlands made by stringing flowers or leaves together and are often hung around the necks of loved ones, visitors and statues of respected people.